It has been almost 20 years since I sat A-levels but the emotional roller coaster of getting my results is as clear as day in my memory. Safe to say, I didn&apos;t get the results I had anticipated and it very much felt like the end of the world. So amid the plethora of results success stories in the media today, let&apos;s spare a thought for those who did not do so well. My heart goes out to you all - but there is light at the end of the tunnel. Through clearing, I secured a place at university studying law with English language - not the criminal psychology degree I was hoping for. But it seems fate was playing its part as, within weeks of starting university, I discovered its student newspaper and my passion for journalism was well and truly sparked. Who knows what twists and turns life will take but one thing is for certain - there is always a route to higher education or employment if you look hard enough. 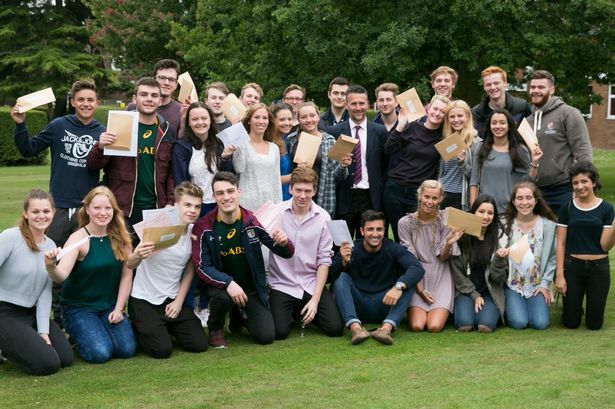 It&apos;s been a mixed bag this year for those sitting A-levels, with the West Midlands seeing an overall rise of students achieving grades A* to E.
A staggering 75,509 A-levels were taken at schools and sixth form colleges across the region this year - and 98.1 per cent of those achieved an E or above. The figure is a 0.3 per cent increase on the 97.8 per cent of A-level grades that were E or above in the 2013/14 academic year, when 74,583 A-levels were taken. However, there was a 0.3 per cent drop in the number of A* or A grades, with 23.3 per cent of those taken this year achieving the top results compared to 23.6 per cent in 2013/14. As new tougher A-levels are set to come into effect this September, critics have claimed this year&apos;s results are a reflection of "easy" tests that are coursework driven. How galling it must be to all those who, rightly so, are celebrating top results today. Teenagers across the country often find themselves in the firing line, yet the vast majority have been working tirelessly to secure good grades and carve out their careers. Congratulations to every single one of you, whether you took A-levels, BTECs or other vocational qualifications and apprenticeships. I wish you all the best for your futures, no doubt they will be bright.